Integrate SoundCloud’s powerful audio player into your app and stream audio directly from your app for more control. Pick from a range of templates to find the best fit for your needs or start fresh with ‘General’. Use the AppInstitute branding wizard to pull in colours and business information with your Facebook/Website URLs. 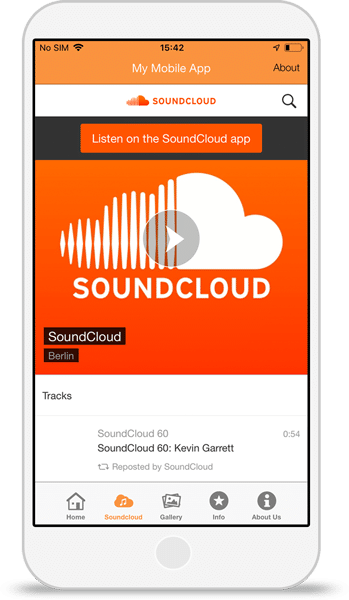 Connect your Soundcloud account to allow app users to listen to your music or podcasts within your app. Use our simplified publish wizard to easily publish your new app on the Apple and Google Play stores.